What are the ports that I need to open? Hi for splunk to work properly, what are the ports that I need to open? Can anyone specify the inbound ports and outbound ports? 9997 for forwarders to the Splunk indexer. 8089 for splunkd (also used by deployment server). All of these can be changed if desired. 9997 is not a default; just a convention. You need to set it explicitly on the receiving instance (indexer). Awesome couldn't be more clearer than that. I downvoted this post because port listing is at best incomplete and another post better answers the question. 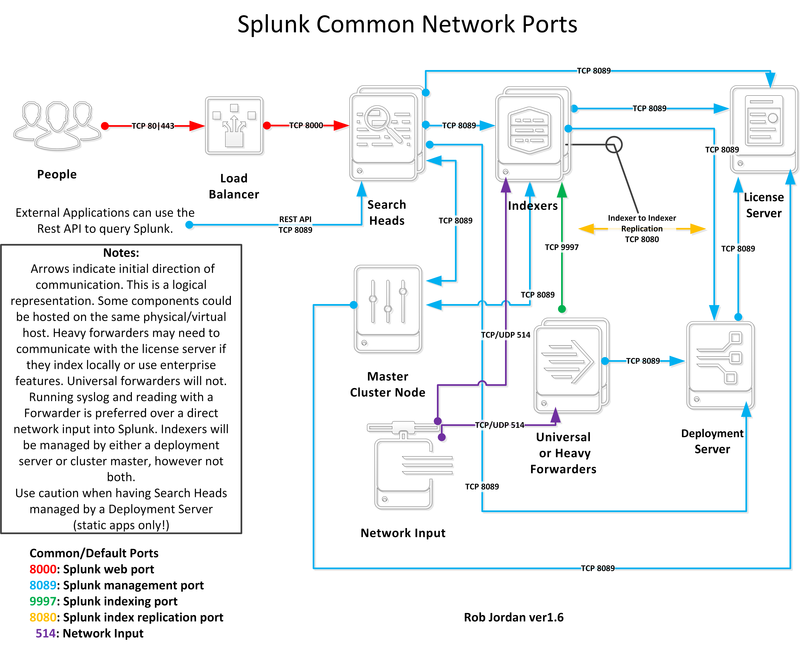 This is a diagram of Splunk components and network ports that are commonly used in a Splunk Enterprise environment. Firewall rules often need to be updated to allow communication on ports 8000, 8089, 9997, 514 and others. Wow. Nicely done. This is so hard to find in the official documentation. I would also suggest adding flows on port 9997 from the search heads, deployment server, license server, and cluster master to the indexers, with a footnote that this is an optional flow used for forwarding Splunk's internal indexes (a recommended best practice). Kudos. This is very helpful Rob. I should get around to updating soon with the feedback I've received. @steven_swor I've added your recommendation. Thank you for this diagram, kind sir. This is excellent. Very helpful. Little typo there on the MANAGEMENT TIER. Does anybody have a version of this made specifically for opening firewall ports between an on-premise installation and splunkcloud.com? Since splunk 6.2 also port 8191 is used for the kvstore. Also note that for Search Head Clustering there is a new replication port that you can pick, e.g. 8181. Also with SHC you need the KV store port (by default, 8191) must be available to all other members. You can use the CLI command splunk show kvstore-port to identify the port number. The replication port must be available to all other members. 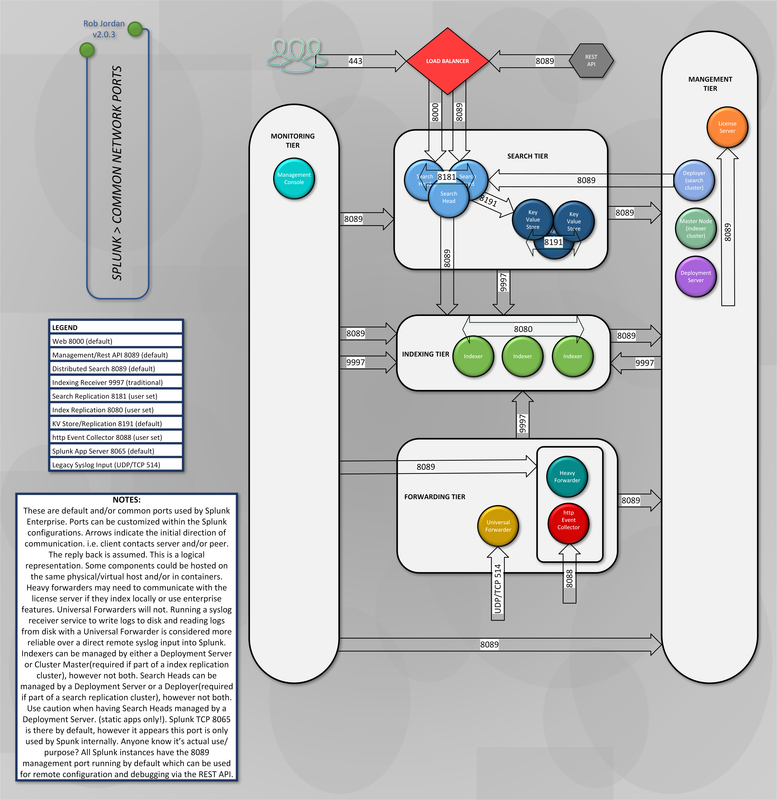 I've taken the liberty of updating the diagram slightly to reflect both changes in code since 6.2 and recommendations between this and one other post. Thanks @rob_jordan for the great effort and for sharing! It seems many are confused about port required from UFs to a HF. Which is 9997 too i.e. Many uses HF & DS as same server. I have similar questions, but I need a bit more detail about direction. Is the splunk forwarder port 9997 tcp/udp from agent to indexer ? Is the splunk management port 8089 tcp only and from indexer/deployment server to agent or bidirectional? 8089 for the deployment server is only needed from the client to the deployment server. Client being indexer, UF, etc. 9997 from the forwarder to the indexer. No connection is needed back from the indexers. 8089 is also used from a Search Head to your indexers. Again only single direction. port XXXX for the replication cluster master, and slaves. and any other ports open to monitor tcp/udp. BTW, on my forwarders, using tcpdump, I never see port 8089 used. I do see the forwarder listening on port 8089, just no data flowing. Seems odd. The communication on port 8089 will only be if you've setup the deployment server. Nice use of colors. One change you may want to review is the direction on the deployer arrows. My understanding is that clients do a pull form a Deployment Server vs the Deployer initiating a push to search peers in a cluster. Splunk will only use src port 9997 as replies (src ports are usually higher numbers). I suspect you're reading this data incorrectly. Unless you've set your indexers to output data to the forwarders, there's no reason for the indexers to initiate communication. If they were, the src ports would be higher random numbered ports. What port does the forwarder need opened to the indexers? What ports need to be opened on the Windows 10 Defender Firewall to allow communication between the Universal Forwarder and Splunk? Does a forwarder implement load balancing when sending data to non-Splunk destinations?